Filming went well, but afterwards Welles was removed from the editing process. Touch of Evil played the B-movie circuit, usually as the second feature on a double-bill. 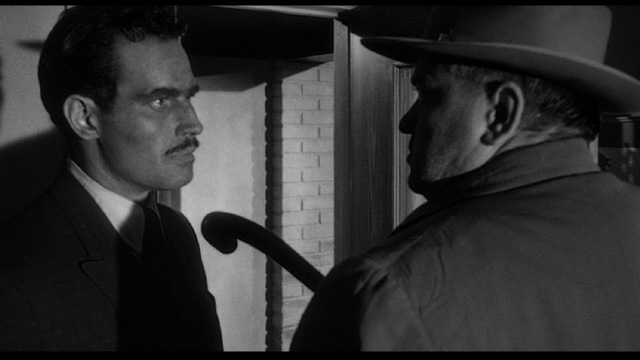 Over the years the film’s reputation has grown and Touch of Evil is now recognised as being one of the last in the great cycle of Film Noir movies of the Forties and Fifties. These films were bleak, but exhilarating in the way the defied Hollywood conventions. They dealt with betrayal, and loss, and broken dreams and their cynical worldview struck a chord with post-War audiences. It is easy to make comparisons between Quinlan and Welles – both are brilliant men but the architects of their own downfall. Welles directed his first movie Citizen Kane (1941) at the tender age of 25. Media mogul William Randolph Hearst took offence believing correctly the film was a thinly veiled biopic of him and set his media pack loose on Welles. The Magnificent Ambersons (1942) was released in a truncated form after the studio RKO got fed up with waiting for Welles to return from filming a documentary in Rio and cut the film without him. Welles made other films on time and under budget, The Lady from Shanghai (1947) for instance, but the bad reputation stuck. After Touch of Evil Welles spent most of his time in Europe, occasionally appearing in big-budget Hollywood films like Casino Royale (1967) to raise funds for his own features.